This chapter discuss on HTML developing, its structure and its applications. one among the 7 world wonders. Built by Shajahan at the river bank of Yamuna. Astonishing tower with height 242 feet. Started by Quthuputheen and successfully completed by Eldhuthmish. Instance for sculpting art. Nick named as love designed in stone. Built by great emperor Akbar. When this HTML page is opened in the internet explorer it will prompt to enter the password as in figure. Figure: India.htm – prompting the visitor to enter the password. Enter the password Indian and click login button. 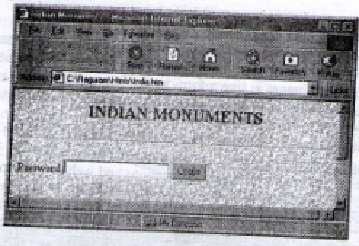 Now the first segment in this document that contains the textfield button, will disappear and the other segments that describes about Indian monuments will appear as in Figure. So far, web pages are created in non visual environment (Notepad). Creating web pages in this method consumes much time and also positioning the controls and elements of web page at proper location will cause the developer’s eye turn to red. As so much of tags are used even to create simple web pages, there, is a chance that few tags may be misspelled. And it is difficult to trace out the error caused due to this misspelling. Visual Basic 6.0 includes new project type called DHTML application, which provides visual environment to rapidly develop the DHTML applications. DHTML applications are structured differently than forms based Visual Basic applications. 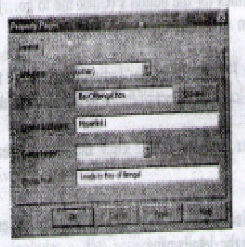 In a DHTML application, the user interface consists of a series of HTML pages rather than forms. An HTML pages is like a form in that it contains all the Visual elements that makes up the application’s user interface. Textbox, Image, radio button and check boxes can easily be placed on an HTML at desired locations. An HTML page is stored in a htm file that is analogous to a frm file. The following table sums up the differences between forms based applications and web-based application. Table: Difference between forms based application and web based application. Visual Basic code that handles the events generated from the HTML pages. A project DLL that contains Visual Basic code is accessed by the run time components garneted automatically when the application is compiled. When a DHTML project is compiled, all HTML pages are stored in separate .htm file. The code that handles the events generated from the HTML pages are compiled in to a .dll files. The id of the .dll file is automatically included in the .htm files. So whenever and event rises from a .htm file, the code for that event in the .dll files is executed by the browser automatically. Visual Environment HTML pages can be created in the familiar Visual Basic IDE. As it is a visual environment, control can be placed in the HTML page at the desired locations easily. Debugging tools can also be used to fix the bugs in VBscripts. Code security When scripts are embedded with an HTML page, anyone can access the page, read the script, and make changes to it. S Visual Basic compiles the code into .dll the code is not part of the HTML file itself, and so it can’t be tampered. Create a new HTML page, or edit the contents of an existing page. Determine which elements on the page re programmable and explore all dynamic elements on the page. Access the code editor window to write code for each programmable element of the page. The following sections brief the different areas of the DHTML page designer. Display a hierarchical representation of all of the elements. Within an HTML page. For each element, the page designer lists the ID (if one exists), the type of control and in some cases the beginning for the content for that element, Elements with IDs are indicated in bold. All elements in the tree view are children of the body element and the document object. Present a drawing surface that enables to create a new page or edit the contents of an existing page. It provides a visual environment to add HTML to the page, position them, and set properties that control their physical appearance. Contains buttons that are frequently used when formatting an HTML page in the designer. The items on this toolbar are available whenever a DIV element, or a hyperlink, or a piece for text, or the BODY or DOCUMENT object in the treeview or detail panes of the designer is selected. When a toolbar button is clicked to carry out the action represented by the button, Visual Basic inserts the appropriate opening and closing HTML tags or tag attributes to the selection. These tags are not visible within the designer, but the result of formatting are rendered in the detail pane. Contains buttons that are fr4equently used when grouping the elements on the page such as by using DIV tag or working with tables. With the exception of the table operations icon, the options on this toolbar band are available only when some elements are selected. The table operations icon is always available. .dsr. the actual .htm files are created only when the application is compiled. This section shows how to create a simple DHTML application, which contains three HTML pages. The First HTML page has a hyperlink that leads to the second HTML page. The second page contains a command whose clicking leads to the third page using code. This is not a full fledged application. But the purpose of this section is to show how creation of the DHTML applications is simpler than by using HTML tags. 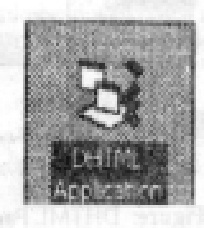 Double click the DHTML application icon. Choose project | Add DHTML page to add the second page. Repeat the above step to add the third page. 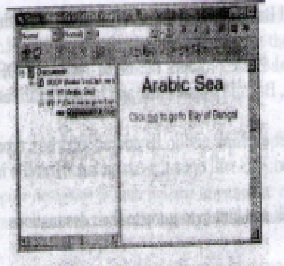 Name the project as seas, DHTML page1 as Arabic sea, DHTML page2 as Bay of Bengal, and DHTML page3 as Indian ocean using properties window. In the project explorer window double click as Arabic sea to bring its design window front. In the format band select header 1 for the HTML block elements combo box and enter “Arabic sea” in the details pane. Select the word “me” and click the make selection into link icon in the element toolbar band. Right click on the word “me” in the popup menu that appears, choose properties. This will display the properties dialog box. 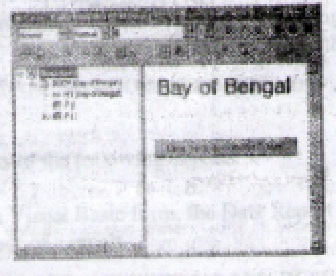 Moves over the hypertext “me” when it is clicked 4 Bay of Bengal .htm page will appear in the browser. Figure: Designed DHTML Page Arabic Sea. In the project explorer window double click the bay of Bengal to bring its design window front. In the Format band select Hander 1 from the HTML block elements combo box and enter “Bay of Bengal” in the details pane. 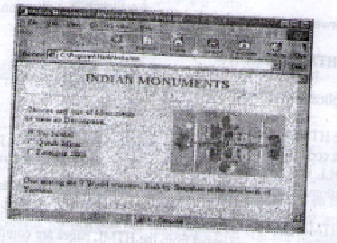 The designed DHTML page Bay of Bengal should resemble the figure. Figure: Designed DHTML Page Bay of Bengal. The above line assign the HTML file name “Indian ocean .htm” to the href (Hyper line reference) property of the location object of the base windows to jump to that file. In the project explore window double click the Indian ocean to bring its design window front. Open the Internet explorer and in its address text box type Arabic sea, htm with full path and hit enter. This will open the Arabic sea. 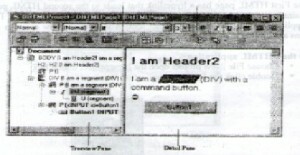 Htm file in the internet Explorer. Test the hyperlink and button to jump to their destinations.